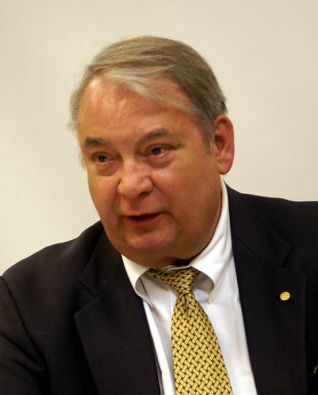 Ferid Murad (born September 14, 1936) is an Albanian-American physician and pharmacologist, and a co-winner of the 1998 Nobel Prize in Physiology or Medicine. He is also an honorary member of the Academy of Sciences and Arts of Kosovo. He was born in Whiting, Indiana to Jabir Murat Ejupi, an Albanian immigrant from Gostivar, Macedonia, and Henrietta Bowman, an American Christian, Ferid Murad was raised as a Christian. He received his undergraduate degree in chemistry from the pre-med program at DePauw University in 1958, and MD and pharmacology Ph.D. degrees from Case Western Reserve University in 1965. He was an early graduate of the first explicit MD/PhD program which would later lead to the development of the prestigious Medical Scientist Training Program. He then joined the University of Virginia, where he was made professor in 1970, before moving to Stanford in 1981. Murad left his tenure at Stanford in 1988 for a position at Abbott Laboratories, where he served as a vice president until starting his own biotechnology company, the Molecular Geriatrics Corporation, in 1993. The company experienced financial difficulties, and in 1997 Murad joined the University of Texas Medical School at Houston to create a new department of integrative biology, pharmacology, and physiology. Here, he was the Professor and Director Emeritus of The Brown Foundation Institute of Molecular Medicine for the Prevention of Human Disease and held the John S. Dunn Distinguished Chair in Physiology and Medicine. In April 2011, he moved to the George Washington University as a Professor in the Department of Biochemistry and Molecular Biology. Murad's key research demonstrated that nitroglycerin and related drugs worked by releasing nitric oxide into the body, which acted as a signaling molecule in the cardiovascular system, making blood vessels dilate. The missing steps in the signaling process were filled in by Robert F. Furchgott and Louis J. Ignarro of UCLA, for which the three shared the 1998 Nobel Prize (and for which Murad and Furchgott received the Albert Lasker Award for Basic Medical Research in 1996). There was some criticism, however, of the Nobel committee's decision not to award the prize to Salvador Moncada, who had independently reached the same results as Ignarro. In May 2012, Municipality of Čair proclaimed him an honorary citizen. During the ceremony Murad said that all his achievements were dedicated to his nation, Albania.